Be the first to share your favorite memory, photo or story of Dustin . This memorial page is dedicated for family, friends and future generations to celebrate the life of their loved one. 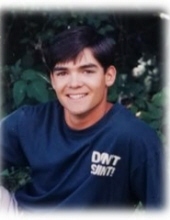 Dustin Glen Rickert, 40 of Prairie Grove passed away April 5, 2019 at his home. He was born March 19, 1979 in Bentonville, Arkansas to Loretta Amburgey Phillips. He is survived by his wife Emily Rickert of the home; children Samantha Rickert, Summer Rickert, ShayLynn Rickert, Wesley Rickert, Austin Hall, mother Loretta, siblings Steven Clapp, Heather Bowen, David Peckham, Scottie Peckham, Christy Peckham-Pledger and one grandchild Brooklyn Hall. To send flowers or a remembrance gift to the family of Dustin Glen Rickert, please visit our Tribute Store. "Email Address" would like to share the life celebration of Dustin Glen Rickert. Click on the "link" to go to share a favorite memory or leave a condolence message for the family.